Former candidate for City Council. Man about Town. 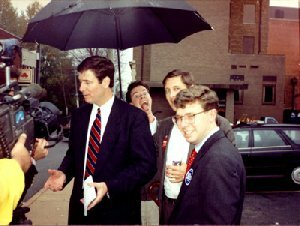 In 1994, Will Lyster ran with Brian Campbell for City Council against Democrats Kay Slaughter and David Toscano. 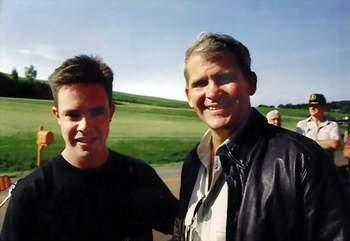 Will then started his own business, Spectrum Computer Corporation. 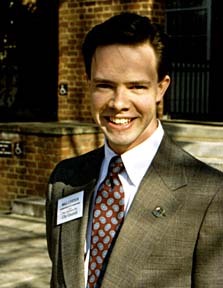 On January 5, 1998, Will went into partnership with Bill Nitchmann (Albemarle Planning Commission - Scottsville Dist.) to establish a company known as Computer Solutions - The Technology Center. They sold this business in November to Automated Office Systems, who is still running it as Computer Solutions. You can currently find Will hanging out at WoodLine (Custom Cabinets and Mantles). 1. What is your greatest fear? I am a pretty confident person, however I have always been afraid of being shot by my own gun. It's not necessarily that I'm afraid of being shot - it just means that I have lost control or allowed the situation to escalate to such a point where as I should have stopped while I was ahead. sometimes have trouble making them known verbally and end up sounding like I meant the opposite. 6. What do you dislike most about your appearance? My hair has a tendency to grow straight forward like Ross's on "Friends'. I know it seems like a trendy style but I hate it. I brush it back and end up with some weird cowlick. strategy of the Rev. Jesse Jackson. 10. Who is your favorite hero of fiction? Beowulf. 12. What is your most treasured possission? My family photo album. 13. What do you regard as the lowest depth of human misery? Being lost, lonely, hungry and cold without a knife. 14.Where would you like to live? Kinsale, Ireland. who said it couldn't be done. 17. How would you like to die? No thanks. 18. What is your motto? Don't worry, don't analyze - decide quickly or just do it. 20. What is your greatest regret? That men don't wear suits and hats anymore - I would have enjoyed tipping my hat to ladies. ears and I'd wag my tail and smile with my tongue hanging out all day. In 1998, as we bring in a new Republican administration, note the picture above, taken by Ed Allen in the Jefferson National Bank parking lot about a week before election day (1993). Courtesy of Will Lyster, pictured left to right are: George Allen, Will Lyster, Randolph Byrd, and Mike Brown. I am told that place mats were made out of the photo. This picture was taken (again by the late Ed Allen) at the Harley Davidson Parking lot in Orange - no doctoring. I like it because I love to see the 'I-smell-catshit' sneer when people look at it. 2. People who say 'Ollie North' in public conversation within the Charlottesville city limits (Will Lyster, electronic mail, May 4, 2000). For more see Happiness is ... and Will Lyster on Million Moms March.